Posted April 25, 2017 . The annual incidence of candidaemia in Italy is 24/100,000 and was estimated at 5/100,000 for Belarus, Cameroon and Indonesia, in the absence of data. Cryptococcal meningitis was estimated to be common in Cameroon at an incidence of 30/100,000 compared with only 0.81, 0.6 and 0.22/100,000 rates in Indonesia, Belarus and Italy, respectively. The prevalence of chronic pulmonary aspergillosis was estimated to be very high in Belarus and Indonesia at 60 and 32/100,000, because of the high burden of TB in both countries, compared to 22 and 4.9 in Cameroon and Italy. Tinea capitis was remarkably common in Cameroon (3,240/100,000 population) and Italy (1,003/100,000 children) – there are no data for Belarus and Indonesia. Asthma and its complications ABPA and severe are thought to be especially common in Indonesia with an ABPA prevalence of 135/100,000 in Indonesia and also Italy 126/100,000 compared with Belarus and Cameroon (62 and 40/100,000). 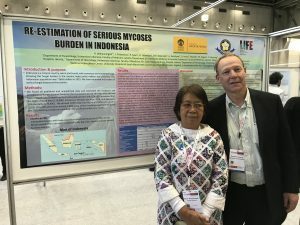 These country estimates bring to 68 the number of countries with serious fungal disease burden estimates undertaken by LIFE collaborators, covering 80% of the world’s population.